Cairt o Cheenae shawin modren-day Shaanxi province (reid) an the ether provinces affectit bi the yirdquauk (orange). 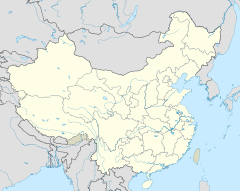 The 1556 Shaanxi yirdquauk or Jiajing yirdquauk (Cheenese: 嘉靖大地震; pinyin: Jiājìng Dàdìzhèn) wis a catastrophic yirdquauk an is also the deadliest yirdquauk on record, killin approximately 830,000 fowk. It occurred on the mornin o 23 Januar 1556 in Shaanxi, durin the Ming Dynasty. Mair than 97 coonties in the provinces o Shaanxi, Shanxi, Henan, Gansu, Hebei, Shandong, Hubei, Hunan, Jiangsu an Anhui wur affectit. An 840-kilometre-wide (520 mi) area was destroyed, an in some coonties 60% o the population wis killed. Maist o the population in the aurie at the time lived in yaodongs, airtificial caves in loess cliffs, mony o which collapsed wi catastrophic loss o life. ↑ 1.0 1.1 International Association of Engineering Geology International Congress. Proceedings. (1990). ISBN 90-6191-664-X. ↑ "China's History of Massive Earthquakes". 12 May 2008. Archived frae the oreeginal on 14 May 2008. Retrieved 16 June 2008. Wikimedia Commons haes media relatit tae Earthquakes of 1556.